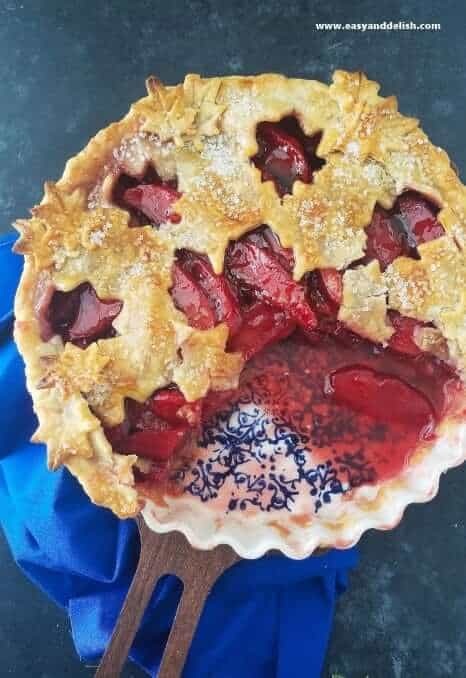 Ruby Apple Pie consists of a gorgeous hibiscus colored apple pie filling assembled with your favorite store-bought double pie crust. An easy to prepare yet stunning Fall dessert! Pies? Well, I shamelessly confess that I love them all! But in my humble opinion, none of the classics or their variations even comes close in beauty or taste to our Ruby Apple Pie. By the way, you will find this particular pie recipe and technique NOWHERE ELSE! It is an Easy and Delish exclusive. That’s right! I was inspired by the new internet sensation, blushing apple pie, in which the traditional apple filling takes on a rosy color. Some recipes use cooked beets to color the blushing apple pie, while others call for red cinnamon candy. Well, ours uses a special ingredient which is widely available in supermarkets in the U.S. and in many countries around the world. : dried hibiscus flower (or alternatively, jamaica agua fresca which is an extract of the hibiscus premixed with sugar). 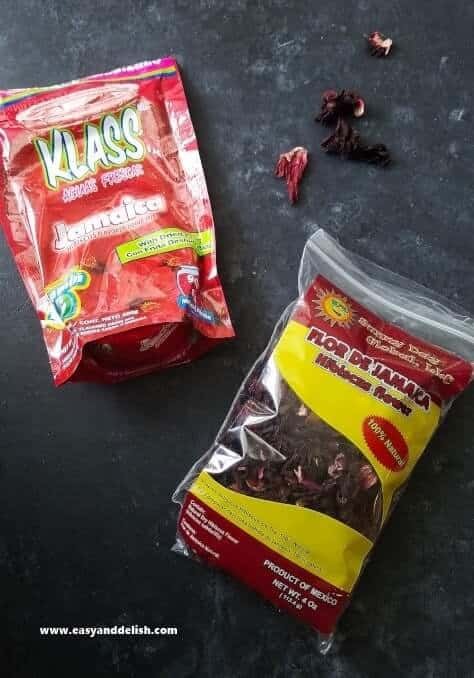 You may be able to find these in the tea aisle, or the Latin foods section, where the dried flowers are called “flor de jamaica” (known in Caribbean countries known as “sorrel” and in Asia and Africa by a wide variety of names). 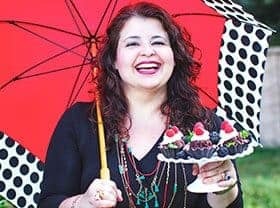 In order to achieve the luscious ruby color, I experimented 3 times, each time with different ingredients: the first using red wine, which turned the apples reddish brown; the second, with pomegranate syrup or grenadine, which barely turned them pink. Lastly, I decided to experiment with hibiscus tea, and it was a success, as you can see. I boiled several cups of sweetened water with a good amount of dried hibiscus flower. Then, I turned off the heat, threw the peeled apple slices into the pot, and let them steep in that tea until coming to room temperature. Finally, I transferred all the contents of the pot to a clean large pitcher and refrigerated overnight. The longer the apples steep, the redder the color! 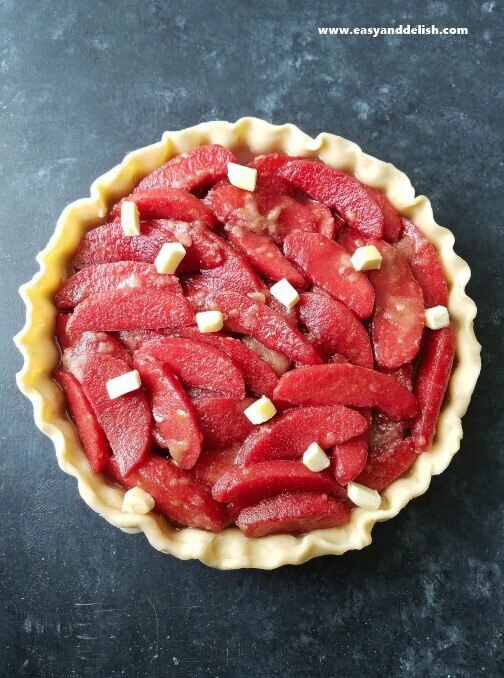 The rest is pretty much just a matter of mixing a few ingredients for the filling and then assembling this beautiful ruby apple pie for baking. And there you have it– the best pie for your holiday table or to impress your guests at any get-together. Ready to make a real hit, the talk of your fall party? Start by whisking water with sugar in a large pot over medium-high heat until sugar is dissolved (about 1-2 minutes). Then, add a few cups of dried hibiscus flower and let mixture come to a boil. When liquid turns deep red, remove the spent hibiscus flowers using a slotted spoon or spider strainer. Place the peeled apple slices into the pot and let cool to room temperature. Transfer everything to a large pitcher or clean airtight container, cover, and refrigerate overnight. The longer the apples steep, the redder the color! Alternatively, you can use jamaica agua fresca powder to color the apples instead of the hibiscus flower. For this, whisk water with jamaica aqua fresca powder (powder is already sweet) in a large pot over medium-high heat (about 1 minute) and let mixture come to a boil. Remove pot from heat and add apple slices, letting sit until liquid comes to room temperature. Then, transfer everything to a large pitcher or clean airtight container, cover, and refrigerate overnight. Again, the longer it steeps, the redder the color! Right before making our ruby apple pie, pour all the contents of the pitcher into a colander and let apples drain free of the liquid for about 5-10 minutes. MEANWHILE, preheat oven to 400 F and unroll room temperature pie crusts on a lightly floured surface. Transfer one crust to an ungreased 9-inch pie plate carefully. Trim bottom crust along rim of the pie plate and set aside. In a large bowl, combine sugar, flour, and spices until mixture becomes homogeneous. Add apple slices, pour lemon juice over them, and gently mix apple slices with the other ingredients. Spoon into the crust-lined pie plate. Dot top with a few pieces of butter. 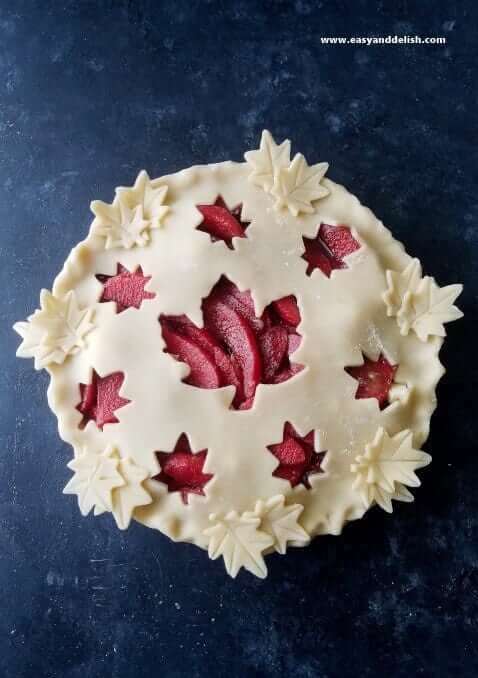 If desired, you can use leaf cookie cutters of different sizes to embellish top crust, or simply use the pie crust as it is to cover and enclose the filling. Trim excess top crust and press edges of top and bottom crusts together to seal. Flute edges using your fingers. If using pie crust as it is, make sure to cut several slits in top crust in order to vent steam. Brush top crust with beaten egg whites and sprinkle with sugar. Bake at 400 F (low rack of oven) for about 40-50 minutes or until apples are tender and crust is golden brown. Make sure to cover edges of crust with strips of foil after 15 minutes in the oven to prevent excessive browning. Transfer baked ruby apple pie to a rack and let cool before serving. Enjoy! Ruby Apple Pie consists of a gorgeous hibiscus colored apple pie filling assembled with your favorite store-bought double pie crust. An easy to prepare yet stunning Fall/Holiday dessert! 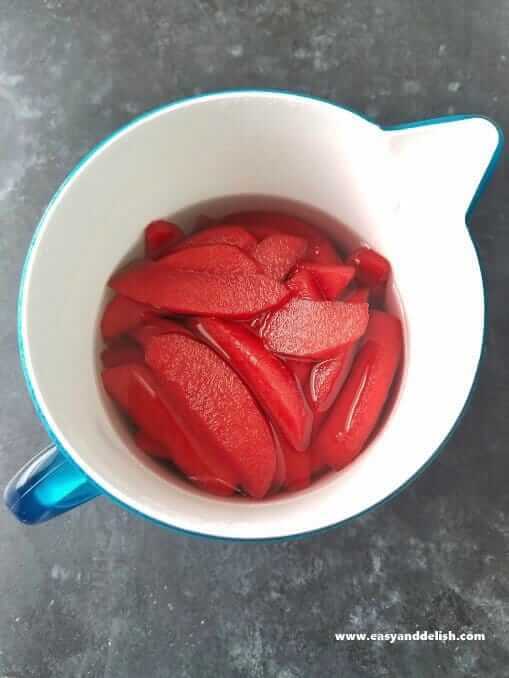 COLOR APPLES: Whisk water with 1 cup sugar in a large pot over medium-high heat until sugar is dissolved (about 1-2 minutes). Then, add hibiscus flower and let mixture come to a boil. When liquid turns deep red, remove the spent hibiscus flowers using a slotted spoon or spider strainer and stir in juice of 1/2 a lemon. Alternatively, you can use jamaica agua fresca powder to color the apples instead of the hibiscus flower. For this, whisk water with jamaica agua fresca powder (skip sugar and lemon) in a large pot over medium-high heat (about 1 minute) and let mixture come to a boil. Remove pot from heat and add apple slices, letting sit until liquid cools to room temperature. Right before making our ruby apple pie, pour all the content of the pitcher into a colander and let apples drain free of the liquid for about 5-10 minutes. MEANWHILE, preheat oven at 400 F and unroll room temperature pie crusts on a lightly floured surface. Transfer one crust to an ungreased 9-inch pie plate carefully. Trim bottom crust along rim of the pie plate and set aside. In a large bowl, combine 1 1/3 cup sugar, all the flour, and spices until mixture becomes homogeneous. Add apple slices, pour juice of 1/2 lemon over them, and gently mix apple slices with the other ingredients. Spoon apple filing into crust-lined pie plate. Dot top with a few pieces of butter. 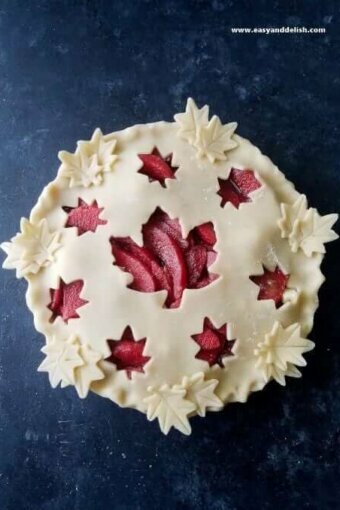 If desired, you can use leaf cookie cutters of different sizes to embellish top crust, or simply use the pie crust as it is to cover and enclose the filling. Trim excess top crust and press edges of the top and bottom crusts together to seal. Flute edges using your fingers. If using pie crust as is, make sure to cut several slits in top crust in order to vent steam. Brush top crust with beaten egg white and sprinkle with sugar. Bake at 400 F (low rack of oven) for about 40-50 minutes or until apples are tender and crust is golden brown. Make sure to cover edges of crust with strips of foil after 15 minutes in the oven to prevent excessive browning. Transfer baked pie to a rack and let cool before serving. Enjoy! TIP: To prevent apples from looking dry, microwave apple jelly for about 30 seconds and brush the apples slices that are visible through the top crust (only if you cut out patterns in the top crust as I did). Both dried hibiscus flower and jamaica agua fresca are available at the Latin Aisle of Walmart and other supermarkets in the U.S. They both give a ruby color to the apples and a mild berry flavor. Ruby Apple Pie can be served at room temperature, chilled, or slightly warm with a scoop of vanilla ice cream. Leftovers should be covered and refrigerated for up to 3 days. Love apple treats? Try our Fried Apple Cobbler Bars. Amazing! This pie would make a stunning Thanksgiving dessert. Hibiscus flower sounds so much more inviting than beets or red hots! Love the colour of this dish, I wont even know it was apples, Coloured like rhubarb. 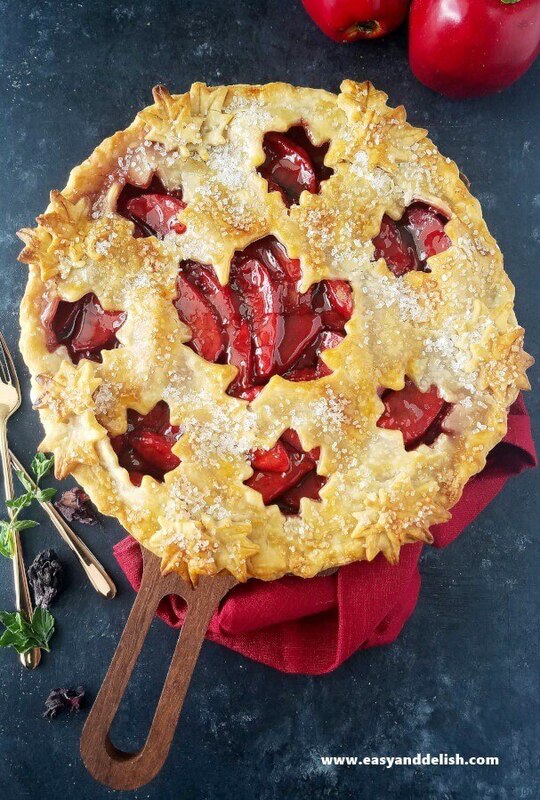 Gorgeous looking pie. Bet it tastes terrific, too. Good stuff — thanks! Thank you. I hope you make this yummy pie and enjoy! This is definitely one of your best posts ever. We loved what you did with the hibiscus flowers and had no idea it can be used this way! We only had hibiscus in tea, especially in some Indian Ayurveda teas sold worldwide (like YogiTea) and it tastes great, so we bet the combination with the apples must be amazing! And the color is soooo beautiful! Definitely trying this one out now that fresh apples are in the farmers markets. Pink lady apples would work great indeed, like you mentioned. Love the pretty red color. Does the hibiscus flower add a flavor to the apples? Hi, Karen. It gives the apples a subtle berry flavor.